Live dealer games have already done much to blur the line between real-world and online gambling, but a company called Authentic Gaming has found a way to make that line even fuzzier. Authentic Gaming takes the regular live dealer concept one step further by ditching the typical artificial studio setup and streaming its games straight from the floors of real, high-end casinos around the world. Authentic Gaming casinos provide a sense of realism to live dealer games that you may not even realize you’ve been missing out on if you haven’t tried them yet. Once you try a few rounds of a game that’s actually taking place in a real casino alongside real patrons of that casino, you’ll have a hard time getting used to the stale atmosphere provided by “regular” live dealer games. Normal live dealer games have come a long way, but there’s no way to recreate the atmosphere of a bustling casino without actually being inside a bustling casino. That is the competitive advantage Authentic Gaming brings as one of the youngest live dealer providers on the market. Authentic Gaming currently streams its real money games from two real world casinos. One of these is the Saint-Vincent Resort and Casino in Italy and the other is the Casino International Batumi in Georgia. In both casinos, the dealers run table games that are open to the public, while also simultaneously streaming them so players from around the world can play along online. 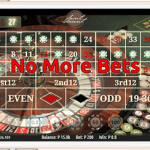 The full live gaming platform is specifically designed be mobile-friendly as well. HD, wide-screen video is delivered to desktops, tablets and mobile phones alike with no loss in quality. 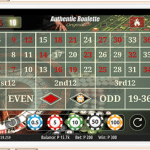 When you access the games via mobile, the controls and video are arranged in a manner such that the video is always full-screen and visible with an opaque betting overlay appearing on-screen whenever it’s time to place your bets. These unique abilities are also helping Authentic Gaming make inroads into new markets. For example, the company now offers its services to casinos on cruise ships. Their system can be installed on a cruise ship so that passengers may play the ship’s casino games from anywhere on the ship – whether those people be inside their cabins, at the restaurant, on deck and so on. Of course, running live dealer games in this manner does present unique challenges. For one, these are real world casinos with real customers that they cannot interrupt simply for the sake of dealing the games online. Authentic Gaming deals with this by allowing the dealers to concentrate on dealing the game for the people who are actually there. You may also notice that Authentic Gaming makes use of carefully-selected camera angles that protect the privacy of the patrons. You will hear the players and maybe catch glimpse of their hands and torsos as they reach out to place bets, but you never see their faces. The cameras remain focused on the betting layout and wheel. The downside to all this is dealer interaction with online players is limited. While the dealers concentrate on keeping their in-person customers happy, the Authentic Gaming system manages your bets and follows the action to track each outcome and issue payouts to winning bets. Thus, you won’t actually see the dealer place chips on the table to represent your bet. 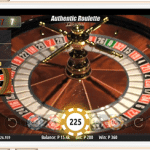 Currently, Authentic Gaming only offers multiple variations of live roulette. These include French roulette, European roulette, turbo roulette, auto-spin double wheel roulette and a high roller version of roulette that affords players advanced betting functions. Games developed by Authentic Gaming offer a few additional features not found on other live dealer platforms. One of the most unique of these is a “bet on stats” function that you can access to see which numbers, groups and colours have been hitting recently in order to plan your bets. When you activate “bet on stats” the betting interface in which each betting option on the table is labeled with a percentage or a number to show which numbers are running hot and cold. For example, the feature might show you that the number 7 has been hit six times over the last 150 spins or that red has only hit 47% of the time over that same period. You can use a slider option to show stats going back anywhere from the past 50 spins to the past 500 spins. The high roller tables unlock additional betting options such as the full complete bet, max bet and neighbours bets.